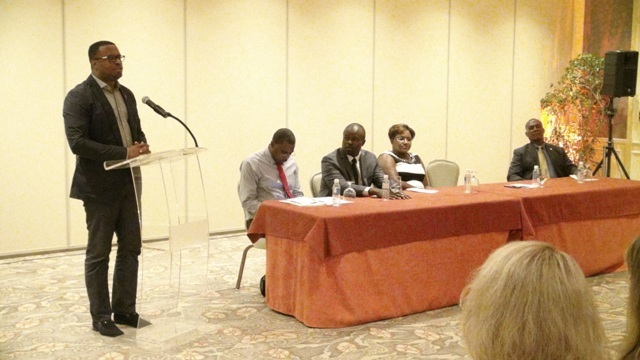 NIA CHARLESTOWN NEVIS (OCTOBER 20, 2015) — Deputy Premier of Nevis and Minister of Tourism Hon. Mark Brantley told a group of more than 30 professionals in the travel trade, that tourism for the island was a way of life and not just a business like some other destinations. 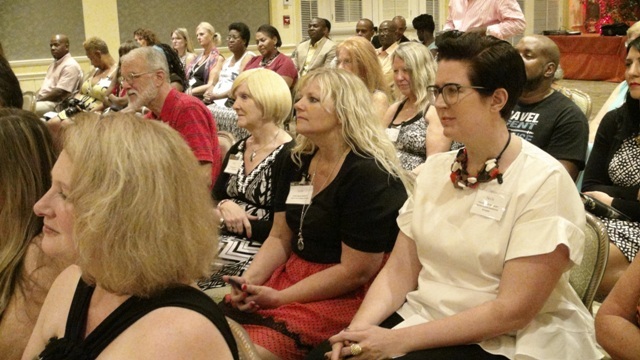 Mr. Brantley made the comment as he welcomed the group at the opening ceremony of the inaugural Nevis Travel Symposium of Romance at the Four Seasons Resort. It was held on October 19, 2015. The week-long symposium – hosted by the Nevis Tourism Authority (NTA) in partnership with Dreamy Weddings, a local business specialising in destination weddings – was designed to showcase what Nevis offers to persons seeking a unique and memorable wedding destination. The Tourism Minister explained, that tourism is the primary source of revenue for Nevis and when travel professional channel their clients to the island, they are contributing directly to the island’s development. “It is how we fix our roads, how we take care of our sick, how we send our children to school. It continues to be the dominant part and engine of our local economy. “When you send people here, I want you to feel you are not just satisfying your client, I hope you do that, but you are also making a tangible contribution to a small island in the Caribbean and for me, that means a lot because this is how we pay our bills. This is how we survive and so, it’s not just a business for us it is a way of life,” he said. Mr. Brantley described Nevis as a beautiful, small and unique island which is ideal for making memories which the expanding and lucrative romance travel market is seeking. “We are, I believe, a quintessential Caribbean. We are a beautiful island, small island. Our motto is ‘Nevis Naturally’ and we don’t just say it we believe it, we live it. “Our people operate in a particular way perhaps, this is, maybe, a Caribbean of a bygone age but we feel that is something very special and very unique. It is, we like to say, not for the tourist but for the traveller it is for people who are seeking memories and that for us is ultimately what a real destination provides,” he said. The Tourism Minister told the participants that Nevis offers many activities among them a beautiful dining scene and he invited them to enjoy all the island has to offer along with its unique history and its people. Meantime, Mr. Brantley expressed hope that the symposium would grow from strength to strength and it will be held next year and in the ensuing years as the NIA continues to build the reputation of Nevis as the best and most romantic destination in the Caribbean. Mr. Brantley used the opportunity to publicly thank the Chief Executive Officer of the NTA Greg Phillip and his team for what he described as a phenomenal job with the organisation and execution of the symposium. He praised them for their continued hard work and also extended gratitude to the authority’s board members who continue to do a good job and give of their services free of charge.